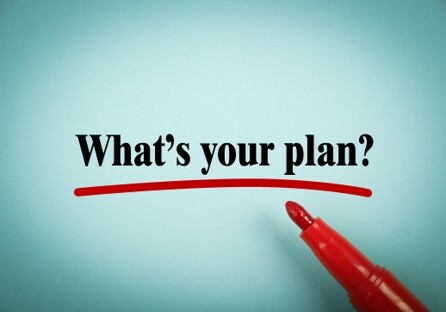 Are you ready to talk about putting the pieces in place before your competitors do so that you can have an amazing finish to this year and a head start on your best year ever next year? Do I have a mission statement? What is it that our company does really well? What are my company objectives for 2018? How much do I know about your competition? Is it time to create or add new tools? Have I recently evaluated my compelling reasons to join? Are they still compelling? Are they still unique? Am I using social media in my recruiting? Is it effective? Am I using text messaging effectively? Do I have a Recruiting page on my website with testimonials and results? What is the title on my business card? What does it say about me? What about my email signature? What CRM am I using? How is my time management and what can I delegate? How much income do I receive per associate on the average? What is my fixed annual overhead? Determine profit desired and add that amount in. How many agents do I need to be profitable? How many recruits for the year? Divided by 12 for recruits hired monthly. What will be the market share increase? How many interviews for each one? 2 experienced agents and 1 new per month is the goal. How many interviews in each category do I need? What action steps/ activities will I do to generate the number of interviews needed? If you want more information on the Virtual Assistance Program, contact Julie Escobar at juliabescobar@gmail.com. If you’re ready to take your business to the next level with coaching, contact me at Judy@JudyLaDeur.com. 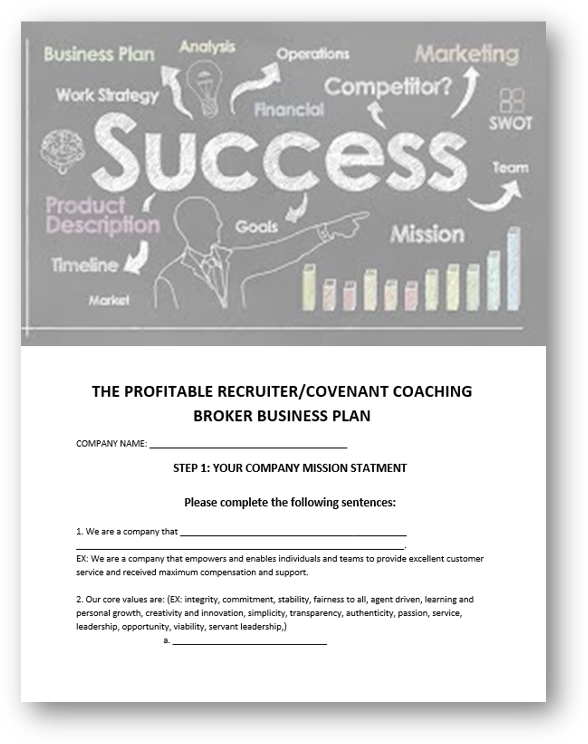 Click here to download a copy of my Covenant Coaching Broker Business Plan. Is recruiting a challenge for you? We can help. Join The Profitable Recruiter and gain access to 7+ hours of audio training via downloadable links, powerful recruiting letters and notes, emails, social media tips, over 30 webinars for recruiting and retention, and opportunities to network with the best of the best. Take advantage of our special offer and save 45% on YOUR New Membership with Promo Code: 45OFF. I love this tool! The DISC tells you how agents are motivated, how they will respond when they are unhappy, and what it takes to recruit them and retain them. I have always used a DISC test when hiring new agents into the real estate industry. I also use a test when hiring team members, admin staff, recruiters and managers. Why? Each of us has specific natural strengths which allow us to do our job easier, which increases the odds for success. As a Broker, Manager or Recruiter, using a behavior test makes your job so much easier! Personality is the basis of who we are and what we do. Here is a quick overview of each personality type. 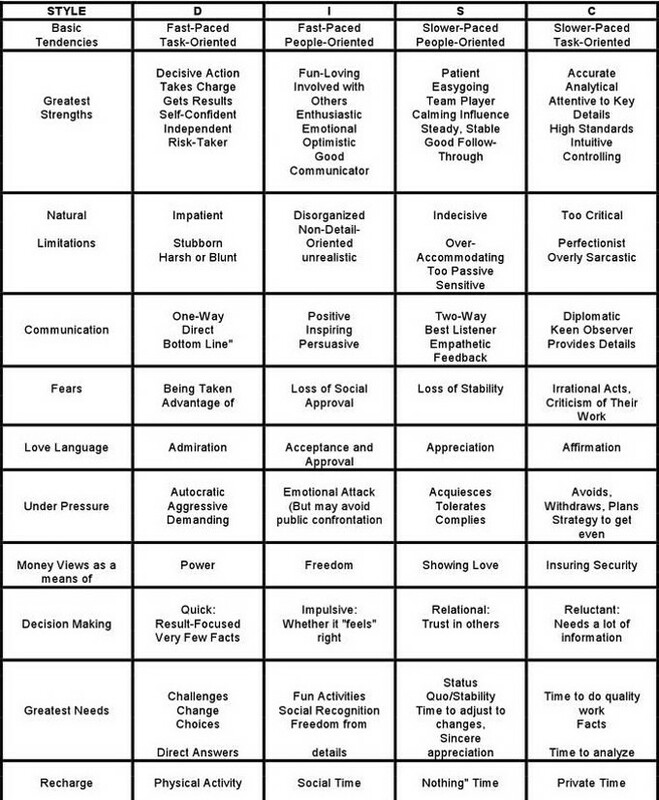 We are including a chart that covers many different areas of each personality type, and how each type responds differently to the same situation. If you are not familiar with the DISC test, one of my favorite sites is http://www.alessandra.com/tahome.asp. Dr. Tony Alessandra has developed several different tests with extensive reports attached. 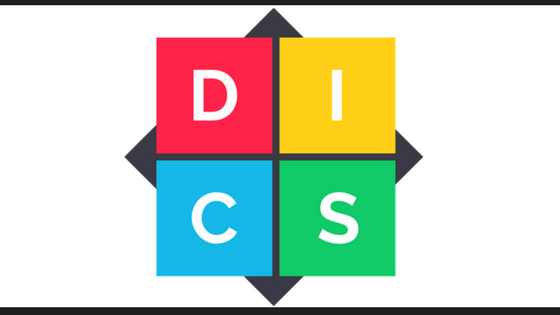 If you have never taken a DISC test, I would recommend that you take one for yourself, as well as the key members of your team. As you get more familiar with the various different personalities, you will be able to quickly determine the behavior patterns of those you manage, live with and are recruiting. Is recruiting a challenge for you? We can help. Join The Profitable Recruiter and gain access to 7+ hours of audio training via downloadable links, powerful recruiting letters and notes, emails, social media tips, over 70 webinars for recruiting and retention, and opportunities to network with the best of the best. Take advantage of our special offer and save 45% on YOUR New Membership with Promo Code: 45OFF. Not sure if this is the right thing for your company? CALL us at 813.957.2989 to learn why brokers across the country are making it their turn to way to stay positioned for recruiting success in today’s market — and putting the fun back into their recruiting. (Which is way better than dread – right?) 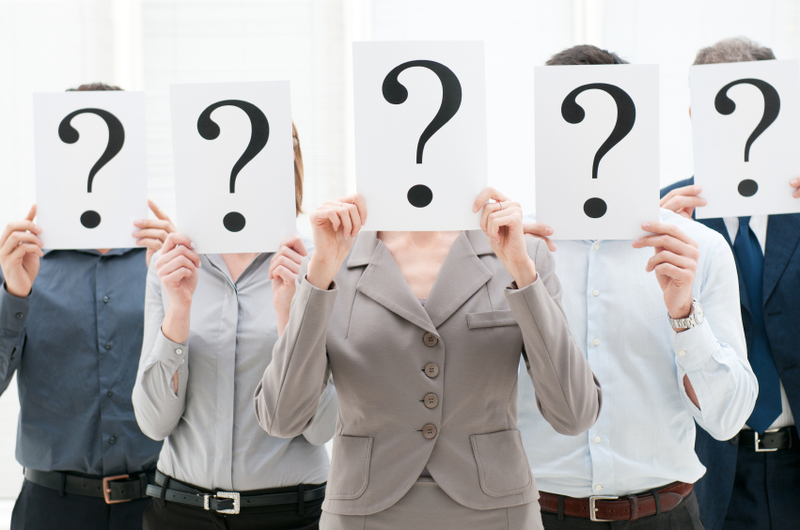 We’re taking the guesswork out of recruiting for brokers — and they are loving it. We can do the same for you! Questions? Email us today. Our market continues to change at a crazy clip and smart brokers and managers are turning to serious systems and tools to keep up. To help make the most of your recruiting efforts, energy and marketing dollars, I’ve put together five top strategies for a successful rest of the year that are generating tremendous results for brokers. Take Out the Guesswork. Be sure to have a SPECIFIC, laid out, retention program to keep the agents that you already have. Agents need to know that they are appreciated and wanted. In changing and competitive times, agents who feel under-appreciated begin to look to your competition for acknowledgement. For those of you who are members, make sure those Monday Morning messages are going out to your current team, not just your recruits and follow the weekly retention action plan that corresponds to your message. Be the Resource. 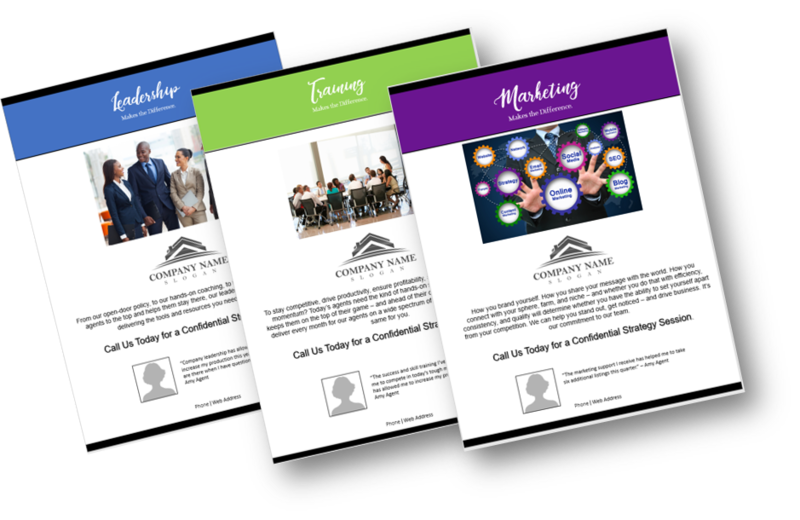 Provide powerful ongoing training, coaching and mentoring to keep your agents productive, ahead of the trends and confident in their skills and tools. Productive agents are happy agents and companies who continue to provide resources for success will grow exponentially over their competitors. Not to mention, like attracts like. If your agents are happy, productive and knocking it out of the park in your market, they’ll catch the attention of other area agents who will be curious as to how your company can help them do the same. Support them. Provide marketing support for two very important reasons. It increases your agents’ business and more importantly ensures that the marketing ACTUALLY gets done. Many agents cut their marketing budgets, which resulted in less business for the agent – but also for the company. 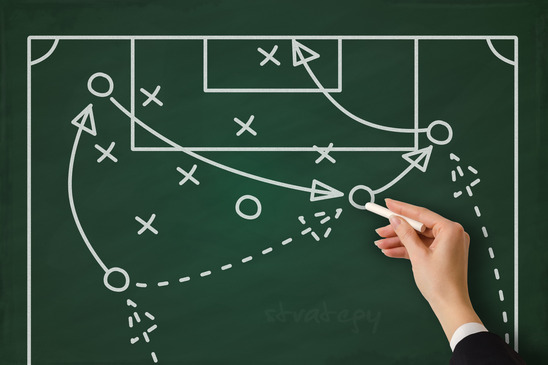 When agents sell homes, companies make money so whatever you can do as a broker to support their business, is always a winning strategy. Turn Up the Heat. While many of your competitors go into holiday “sleep mode” — it’s your turn to dial things up. Implement a strong recruiting campaign which consists of marketing, calls, social media, advertising, and interviews weekly! 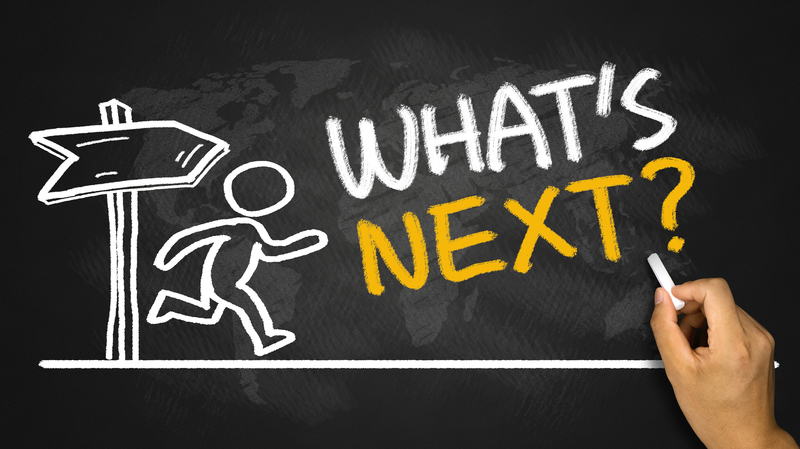 Now is the perfect time to keep your ears to the ground and your eyes open for trends in your market that you can leverage. A competitor that pulls back on resources. A change in management at another company. A top producer who isn’t being recognized. Use these trends to your advantage and RECRUIT, RECRUIT, RECRUIT! Know your numbers! What I mean by that is—know your value propositions. What is the VALUE of being with your company? How many referrals do you generate per agent? What percentage of their business is generated by something you’re providing? 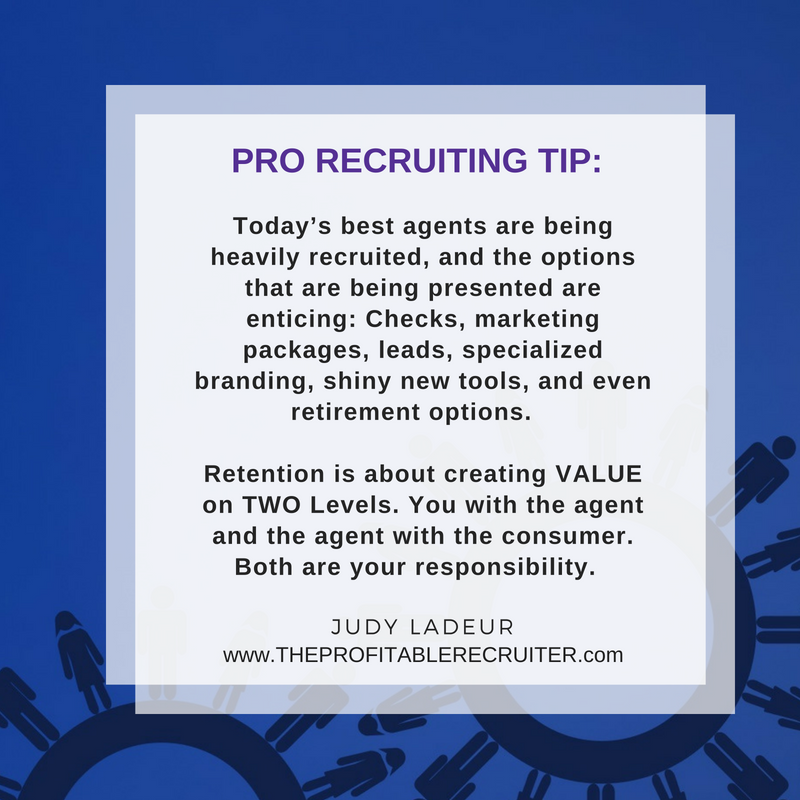 I am always amazed how few brokers know what percentage of an agents business is as a result of something that company does to support them…and that is the key to recruiting and retention! Hope you’ve found these tips helpful. If you’d like to learn more about growing your business, building the right team or working a SMARTER recruiting plan (because harder is no fun) then EMAIL US today. What are you waiting for? Join today and save 45% — and add up to 10 managers on your account at no additional cost. How many agents have you talked to the past 12 months who were not ready to join, but gave you permission to stay in touch? One of the easiest ways to recruit more agents each year is to follow up with those who say “no” initially. 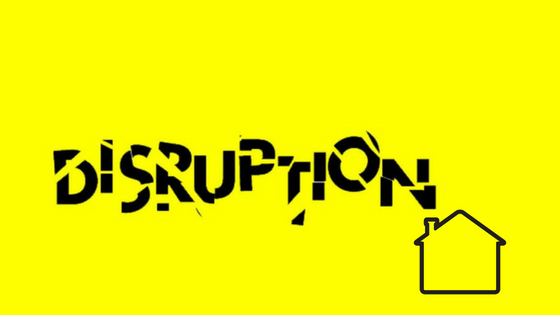 The decision to change offices is a tough one, and when the market is strong, it’s even tougher! Sometimes, due to fear of the unknown, the agent will stay put. Have you ever heard that people will stay with something they know, even if it is not good, rather than make a change? The logic is that at least they know what they have. Change requires that they venture into the unknown. 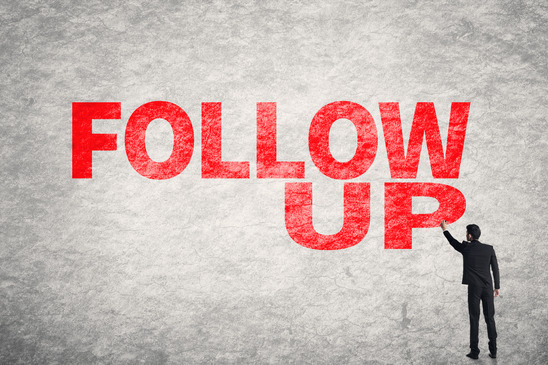 However, brokers who consistently follow up with agents after the interview, say that up to 50% of their hires each year were results of follow up. 1. Call. One of the least favorite things for brokers to do, but one of the most effective. 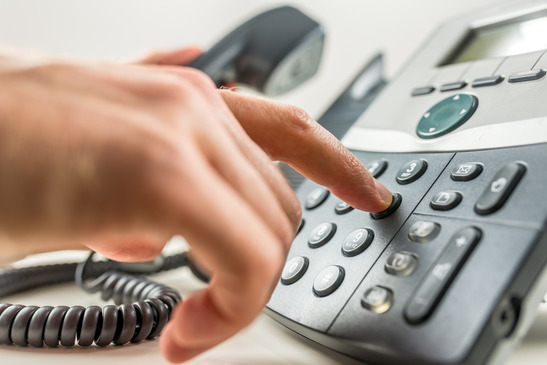 Some of the best people to call are those your agents have had transactions within the last 30-60 days. If they’ve had positive experiences, call those agents and congratulate them on their professionalism and give them kudos for a job well done. Let them know if they are ever interested in exploring other options – you’d love to sit down and meet. 2. Send a Lumpy Letter. These are perfect for capturing attention, showing that you are not only interested but a creative and even fun broker that’s willing to be outside the box. It gets them thinking — and talking! Sometimes it’s even good for recruiting more agent than one for that very reason! Learn more here. 4. Be present in your market. This is no time to be a stealth broker. Agents are busier right now than they’ve been in years. When they see a broker who takes time out to attend broker opens, board events that they are honored in, charity functions that they are part of, etc. — it shows them that you are more than a name on a door. It shows them that you someone who’s willing to be part of their solutions. 5. Make an invitation. Got an agent you’d really like to sit down with? Let them know. Send them an invitation for a cup of coffee, or a lunch at their favorite spot. Let them know, no pressure, no sales pitch. You just would like to get to know them a little better and you appreciate what they are bringing to your market. 6. Offer training. Right now agents are often in 24/7 mode, but offering training at the end of the summer with a great speaker, powerful topics, and terrific takeaways can be a great introduction to what you bring to the table. Let them know it’s the kind of training that sets the perfect pace for the rest of the year and will help them kick off a fantastic fall season. Make it easy and non-threatening for them to register, and extend the offer as a by-invitation-only event. Now, more than ever, it’s important to FOLLOW up with agents. Why? We have just had the best real estate market that most agents have ever experienced. When they are making money, they feel confident. They also feel valuable. Pick up the phone and call the agents on your hit list this week. You might be surprised to see how many are willing to meet with you. Make recruiting a priority now. 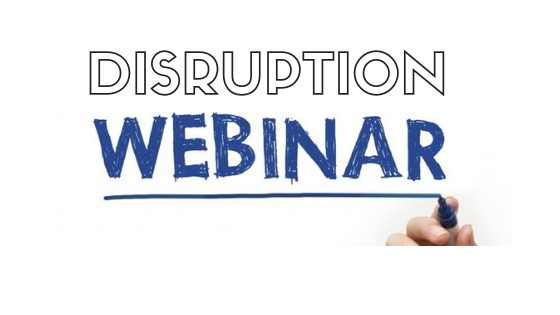 Profitable Recruiter Members – be sure to check out the Webinar-on-Demand with Mark Strosnider. 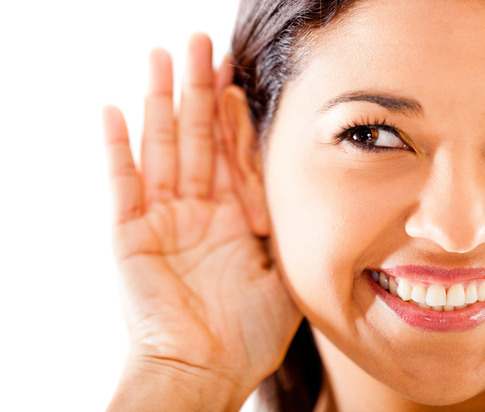 While you’re there be sure ALL your agents listen in to Marti Hampton’s insights. Both of these presentations were powerful in content. Mark consistently hires 30+ agents per year and what he has to say about staying in touch, following up, and using humor is something EVERY recruiter should listen to before they get on their next call. Marti shared how she got 100+ leads in less than two weeks with two VERY innovative marketing strategies that I’m sure savvy agents will be adopting all across North America. Thank you to both of these top professionals for their candor and their willingness to share. Login to watch these on demand now. If you’re ready to dial up your recruiting and position yourself to attract the agents you want sooner rather than later, join top brokers from around the nation who are members of www.TheProfitableRecruiter.com. You’ll get all the tools you need each month to position yourself as the broker to join when agents are ready to make a move. Fine-tuning your skills this season? All pro members get access to over SEVEN hours of training via downloadable links including interview skills, scripts, objection handlers, and more. PLUS, you’ll have access to entire libraries of recruiting letters and notes, emails, social media content, training webinars for recruiting and retention, and opportunities to network with the best of the best. Join today and take advantage of our special offer of 45% off with the promo code 45OFF any membership. That’s 45% off everything you need to be in the right place at the right time when the agents you want are ready to make a move! Phone Calls: When you are making your calls, remember that you should not do all the talking. Tell them why you are calling, then ask questions. Ask them what they know about your company, how their career is progressing, what they would want in a company if they were to make a change. Learn as much as possible about that agent. Remember, if they are emotional, the more they talk, the better you are doing. The Interview: Before you begin to tell them what your company has to offer, you must first ask questions to determine what they are looking for, what they are unhappy about, what they would want if they were to make a move, etc. The more effective you are at asking the right questions, the more likely you are to present the right systems. The Presentation: While presenting your systems, the interaction between you and the agent is critical. If you are the only one talking, chances are that they will start to tune you out. Keep them engaged in the interview by asking them questions and getting their feedback as you present your systems. Again, if the agent is emotional, the more they talk, the better you are doing. 70% of all sales agents are emotional by nature. If you keep them engaged in the conversation, you will have a much better chance of hiring them that day! The Close: The close is a statement designed to have them take action and commit to joining your team. When they have concerns, they will throw out stalls and objections. This is when questions are very important. Don’t try to overcome the objection right away, but instead, follow the 5 step objection handling process. By asking questions about their concerns, you can usually discover the best solution for that objection. When you have the best solution to the problem, ask a question to tie it down. “If I can solve (the problem), is there anything else that would keep you from saying yes today?” If that is the only problem, solve it! We all know that Einstein was a genius. What you might not know is a famous quote that says it all when it comes to asking questions. Albert Einstein said: “If I had an hour to solve a problem, and my life depended on the right answer, I would spend the first 55 minutes determining the right questions to ask!” When a recruit is sitting in front of you, you have one hour to solve the problem of “What would it take?” When you take the time to ask the right questions, everything gets easier!